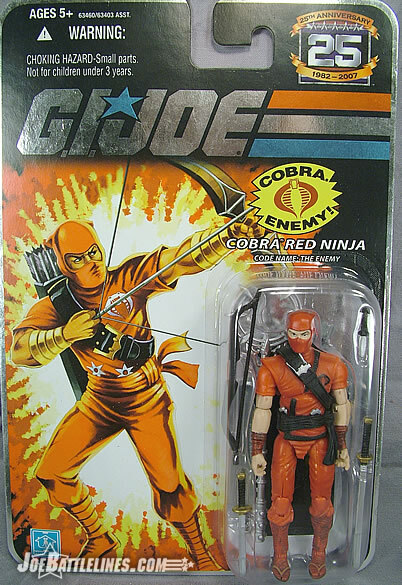 I can still remember the first appearance of the Red Ninjas in Marvel Comics GIJoe: A Real American Hero #21. Storm Shadow walks into a room to be met by three figures who are hanging like bats from the ceiling. 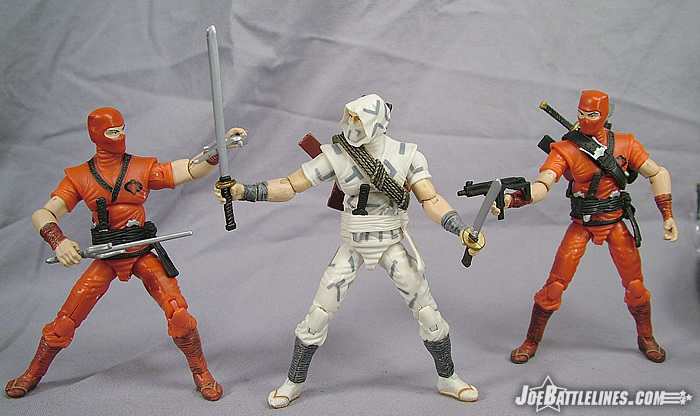 The figures drop to the ground and reveal themselves to be three ninjas, each with different weapons, who bow to Thomas Arashikage. Without saying a word, those three characters made an impression upon my young mind that has lasted to this day. Sure, when the dust settled they were completely unsuccessful in preventing Snake Eyes from escaping from the Silent Castle. He was, however, the hero of the piece and so that was a foregone conclusion. What they did, however, in the course of that issue was secure themselves a place in Joe history that ensured that I’d have to buy three of this figure when it was released. This review will mark the third time that I’ve written a figure review of this particular body mold. (The fourth will be next week when I sit down and tackle the Cobra Legions five-pack I found last week.) 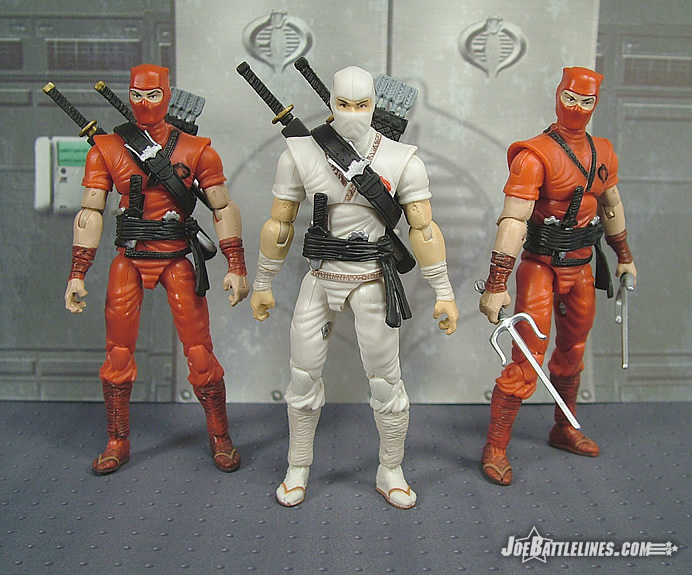 The Red Ninja’s body is the same as the one used for both the Battle Pack Storm Shadow as well as the single carded Storm Shadow v2. 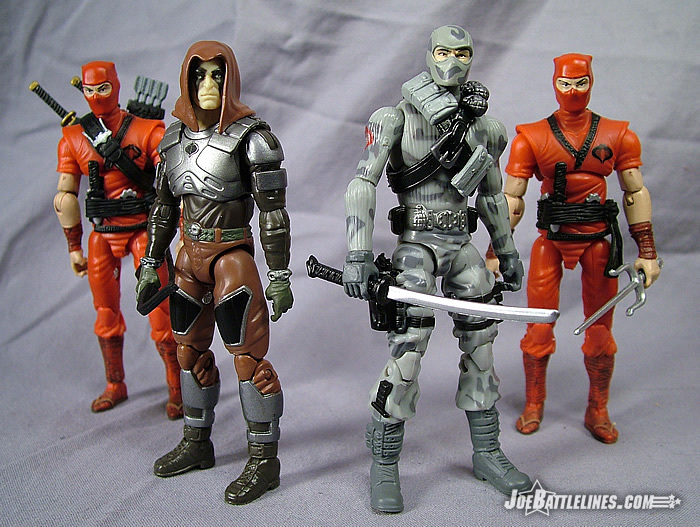 The only real change to the color scheme over the first Storm Shadow is that the figure is molded entirely in dark red plastic and that the uniform top features black paint along the seams. The figure’s sandals are painted brown and the wrappings on both the calves and forearms have a slight black wash to them but otherwise the figure is, for all intents and purposes, the same. In the case of the Red Ninjas from issue #21 this reuse of a familiar body works for me as, at that point in continuity, I just assumed that the three ninjas were Storm Shadow’s students. These pupils simply chose to wear a uniform similar to their sensei in order to better emulate his techniques. 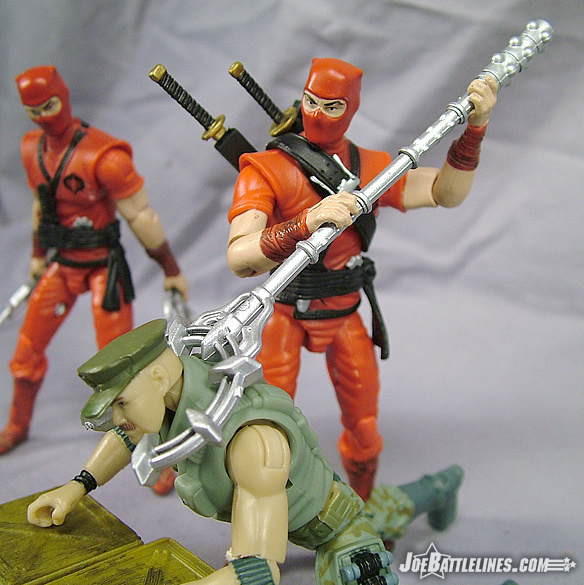 I realize that the Red Ninja clan was given a much broader back story as the comic series progressed but this is what my initial impression of the three “Crimson Amigos” was. I’ve no problems with seeing the body reused one more time here but I really do hope that, aside from the forthcoming TRU five-pack, this is the last time. 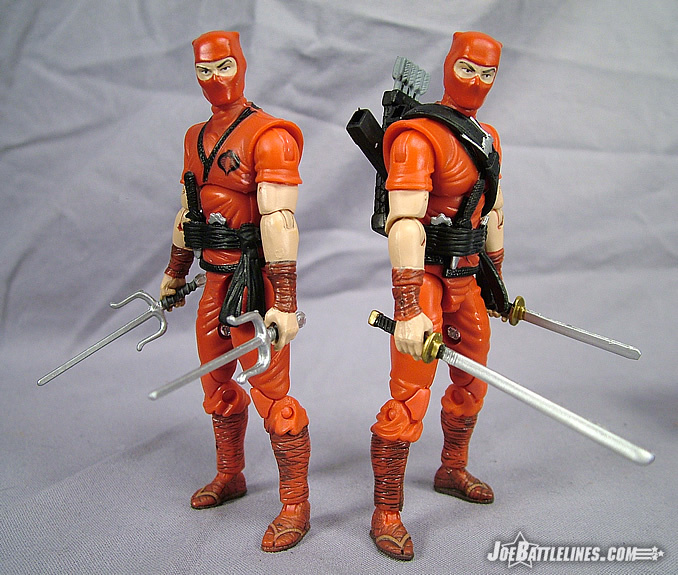 The one stylistic difference between the head designs for original Storm Shadow and the Red Ninjas were the odd little folds of material at the top of the ninja’s masks that almost appeared to be horns. 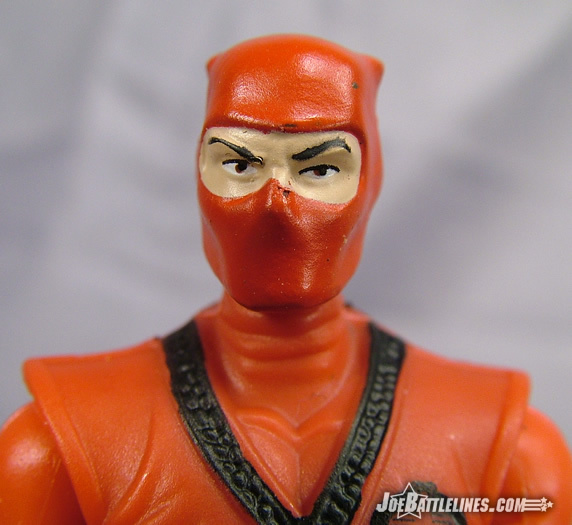 This figure’s head sculpt faithfully reproduces those peculiar little folds as no other attempt to produce a Red Ninja figure to date ever has. The head works well right down to the arched eyebrows and the look of “angry annoyance” that seems to be project from the figure’s eyes. Otherwise the head is completely smooth—devoid of any other details which again I don’t have a problem with. Had this been a major character, I’d expect a bit more detail but the Red Ninjas are essentially “martial arts cannon fodder”—the ninja equivalent to original Star Trek’s security guards. (We all know how well they fared on a mission.) 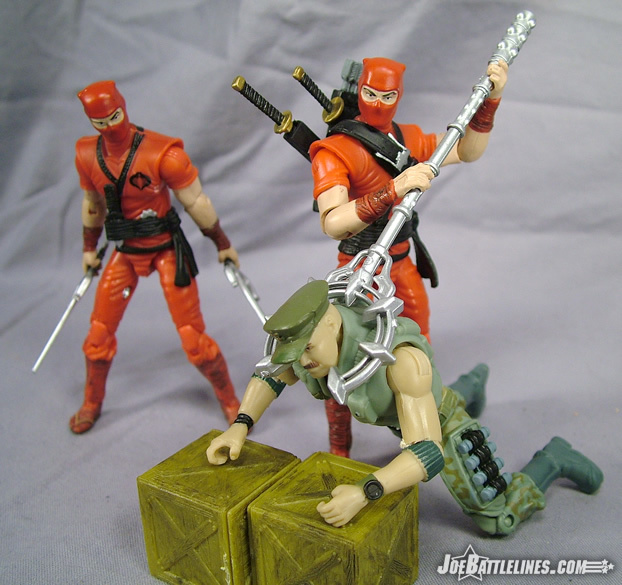 The Red Ninja’s included gear, like the rest of his body, is identical to the Battle Pack Storm Shadow—right down to the Arashikage symbol on the back packs. 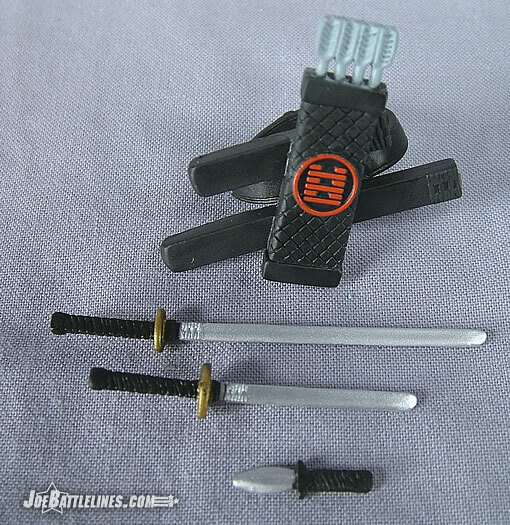 Personally, I’d like to find a more “comic accurate” set of weapons for my three ninjas but that’s a reflection of my take on the characters. The only additional piece of gear included with the figure is a very unusual looking staff which I’ll discuss in a moment. By searching the web and skimming through a few books I own on ancient weapons, (Yeah, who knew?) I was able to determine that this particular staff weapon is most likely a “catch pole” or “man catcher”. Used in Europe as recently as the 18 th Century, this peculiar-looking object was literally designed to subjugate prisoners or even to facilitate in the kidnapping of nobility. The pole features a large C-shaped construct at its head with the opening located 180 degrees away from the shaft. The inside of the “C” was lined with a variety of small spike or protrusions and the top featured a type of spring-held arms that would allow an object (in this case a human neck) to pass through them in one direction. The arms would then spring back to their normal position, narrowing the opening and preventing the object from passing back through as it had original entered. Once held in the grasp of the “C”, the victim could be manipulated by the positioning of the pole with the spikes on the inside providing “negative reinforcement” for those who struggled against their captors. One source indicated that the implement was designed to facilitate the capture of nobles who, it would be assumed, were already wearing armor and would therefore receive no permanent damage from the device. Another source, however, indicates that it was particular useful in apprehending those who owed taxes to the nobles of the land and that any injury that occurred while held in the device was “their own tough luck.” Regardless of how it functioned, I’m both puzzled and excited by it’s inclusion in this figure’s kit of gear. It’s a very unique weapon—both in appearance and function and yet I don’t recall having ever seen one used in any issue or episode of a GIJoe-related title. Still, rather than just having yet another differently colored version of the original Storm Shadow’s gear, Hasbro opted to give fans something new and different and it certainly works well in that regard. When pictures of this wave first circulated around the web, many fans speculated that this figure would be the infamous “Satan” or “Sei Tan” character that was based upon the South American repaint of the original Storm Shadow figure. 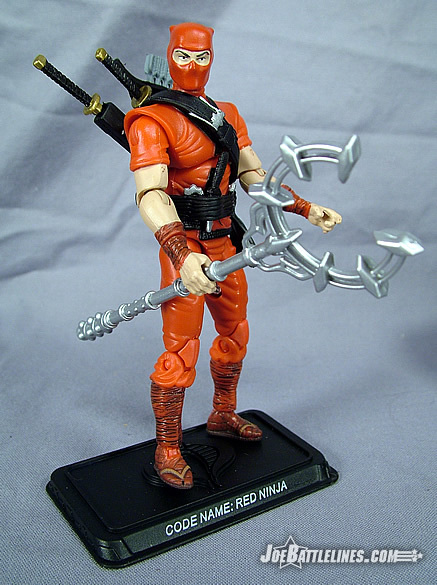 However, I’m personally glad that this was released instead as the Red Ninja—offering fans yet another figure that could be purchased for troop-building purposes. Let’s be honest- -the more figures that sell in this line the more likely Hasbro is to continue the production right up until the eventual live-action movie-based line hits stores in 2008. As such, as long as the troops offer interesting variations on an existing sculpt, I’ll stay interested. While I don’t see this figure as part of “vast shadowy sect”, I do still enjoy it for what it is. In my mind’s eye this will always be one of those three ill-fated martial artists who crossed paths with Snake Eyes as the Silent Castle in #21 and, as such, I see myself owning no more than the three that were depicted in that issue. 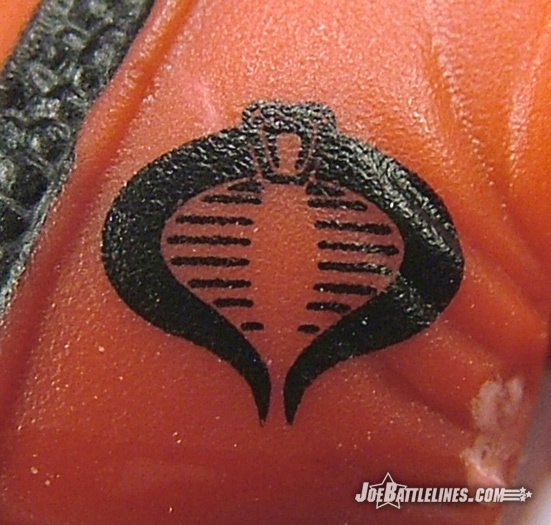 So, fans of the comic series or of the ninja aspects of GIJoe are going to want to add this piece to their collections. 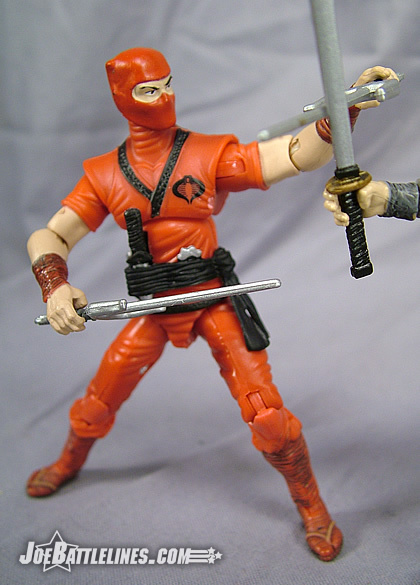 As for the rest of you, I’d actually say that you should give the Red Ninja a try as it’s a surprisingly fun figure with one heck of a unique accessory.